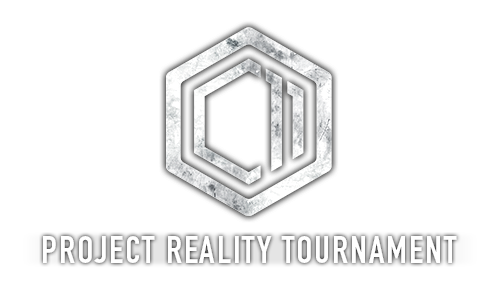 The PRT Management Team is happy to announce the 11th Campaign of the Official Project Reality Tournament! Following the thrilling and balanced battles of Campaign 10 (decided by a grand finale). Once again, the PRT Staff have been working hard to prepare for this year's tournament, and once again we aim to deliver the ultimate Project Reality experience. The new Staff, consisting of PRT Veterans, are also excited to announce some brand new features for this campaign. Designed for newcomers and hardened veterans alike, the PRT will provide a professional atmosphere for all types of players to improve and experience PR at its best. 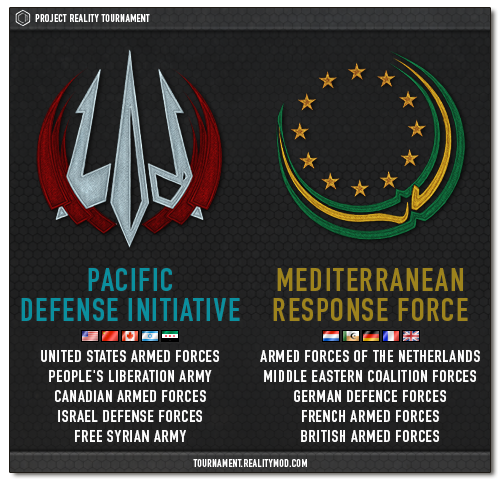 In this large-scale campaign, we are pleased to introduce two newly formed coalitions: The Pacific Defense Initiative (PDI) will fight against the Mediterranean Response Force (MRF). Both teams will be assigned specific factions to play in order to contest the other for supremacy in the tournament. This campaign was adapted to fit the demands of all the changes of the mod that have been made since the last campaign. With PR going standalone and having celebrated its 10th anniversary this year, this tournament will show you how the mod is meant to be played! 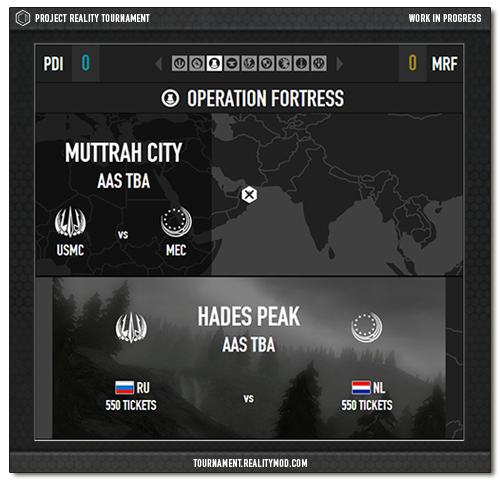 Two new teams: "Pacific Defense Initiative" (PDI) and "Mediterranean Response Force" (MRF). Our tournament coders and artists are working hard to create the new UI for the campaign operations board which will guide the teams throughout the campaign. You can access the current version of the interactive operations board here and read up on how it works in our FAQ. The Officer Sign-Ups are scheduled to open on: September 14th. The Grunt Sign-Ups are scheduled to open on: September 21st. PRT C10 was a blast, it didn't matter if it was on the front lines or watching from PRISM. The campaign was a bloody, edge of your seat, hold your breath moment the whole way through. C10 epitomized the ideal tournament. There was fierce competition from each side, but the relationship between both teams was amicable and gentlemanly. You won't get this atmosphere anywhere else. By far up the most fun I have ever had in project reality without question. I learned more from the PRT in the span of five months than I had in five years of playing project reality. PRT is what you want and expect from PR in its most optimal form. The teamwork and cooperation that got you into PR but then multiplied by an infinite amount due to motivated teams and greatly organized battles. The PRT will be as good as you let it; in the campaign you are surrounded by discipline, competition, and strong leadership. when you are in battle you have an unbreakable bond to your squad-mates that gets stronger every battle, and a fiery passion to eliminate anyone who wants to do harm to your squad. In C11, PR will be more than just a game. Last edited by [R-DEV]Mineral; 2015-09-09 at 14:37..
Last edited by Curry; 2015-09-06 at 16:30..
We had BLUFOR vs OPFOR for 10 Campaigns now already. Its time to spice things up. This way every team has both, Opfor and Blufor factions with spread equipment. You cannot have a more diverse and balanced faction setup than that. 12.5 Who plays as Russians and Militia and why? To establish proper faction balance in C11 it was decided to leave Russia outside the teams and to use it as a proxy faction. In the fictional world of C11, Russia is a third big player on the global battlefield, fighting for its own interests and rejecting alliances with the two teams. The team with no set faction on a map plays as Russians. Militia operates in a similar manner, and is backed by the opposite team when fighting a set faction. Kozelsk is an exception. Here PDI plays as Russians while MRF plays as Militia. Last edited by [R-CON]Spook; 2015-09-06 at 01:25..
You just killed uzi's immersion. waitin for dem officer sign ups! Anyone want announce that they're signing up for SCO/CO?